One of the most important lessons every tradie business has to learn, often painfully, is that cash really is king. I’m not talking about paper money – I’m talking about cash flow. In-flows of the real stuff. Simply put, it doesn’t matter how much money is coming in the future if you don’t have enough money to pay the team this week. If you can’t pay your financial commitments as they fall due, you may be trading insolvently (no money in the bank to cover your liabilities). And the scary part is that this can happen to good businesses. Having plenty of work on the books doesn’t help if there is no money in the bank now. Which is why you need to closely monitor and manage the cash ins and outs in your business. Business owners who monitor cashflow can be unrealistic when it comes to predicting the cash in-flows. They have a tendency to overestimate cash coming in, and underestimate costs and cash out-flows. 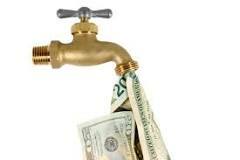 Business owners fail to monitor and manage cashflow full stop! We liken this to driving your car at night with the headlights off, the accelerator down, and the driver unaware they are about to drive straight off a cliff! Profit is the difference between income and expenses. Income is calculated at the time the sale is booked, rather than when full payment is received. Likewise, expenses are calculated at the time the purchase is made, rather than when you pay the bill. This is the basis of Accrual Accounting, which most people use to manage the financial side of their business. This has no bearing on how much money you have in the bank. Cash flow is the difference between inflows (actual incoming cash) and outflows (actual outgoing cash). Income is not counted until payment is received and expenses are not calculated until payment is made. Cash flow also includes infusions of working capital from investors or debt financing. This is the basis for Cash Accounting. Understanding how these two systems differ and how it applies to your business is very important. For all our clients we implement a 13-week rolling cash flow forecast. As part of a weekly management process the cash flow forecaster is updated with planned cash in and cash out for the upcoming 13 weeks. This clearly highlights any potential cash flow shortfalls. As an example if you are forecasting cash to be in the RED in 6 weeks’ time you can proactively call customers to ask if jobs or payments can happen sooner, call those you owe to ask if you can push out when you will pay, ask your accountant to put a payment plan in place for the ATO, or if required seek assistance with finance. The key to monitoring and managing your cash flow is that you are provided with the time to proactively make the right decision, that will enable you to sleep easy. As opposed to being reactive which often ends in disaster, leading to no sleep at all! Ask Cube Performance how we can assist you in implementing your 13 week cash flow forecast using The CUBE Business Intelligence software platform.